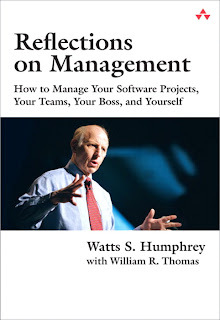 In Reflections on Management: How to Manage Your Software Projects, Your Teams, Your Boss, and Yourself Watts Humphrey presents a number of essays discussing how to manage software projects, teams, bosses and yourself. It's a short read even though it's 240 pages. From Watts' bio it's clear he has a lot of experience with large software projects. He was at IBM for 27 years and through his time with SEI he helped define what would become CMMI.